Adult ADHD is often obscured by comorbid conditions such as depression, anxiety, and substance abuse. Impulsivity, distractibility, disorganization, restlessness, emotional outbursts. In children, these symptoms would be recognized by a teacher, and the parents would be referred to a medical professional for an attention-deficit/hyperactivity disorder (ADHD) evaluation. * In adults, these symptoms may lead to people getting fired, getting divorced, or simply being labeled as lazy or irrationally angry. A recent World Health Organization (WHO) study estimated that 3% to 4% of adults worldwide have ADHD, with a rate of 4.5% in the United States (de Graaf et al, 2008). Of those, a large number—possibly 8 million to 10 million—are undiagnosed. Millions more do not receive appropriate treatment (Barkley, Murphy, & Fischer, 2008). The WHO study also reported that adults with ADHD miss an average of more than three weeks in workplace productivity yearly. The Centers for Disease Control and Prevention (2009) has estimated the costs of such work loss at $3.7 billion. “Adult ADHD is chronically misunderstood. A multitude of patients have spent years spinning their wheels in psychotherapy without having had their ADD diagnosed or treated,” says Roslyn Ross Steeler, MSW, LCSW, a therapist for 28 years. She has focused on the treatment of adult ADHD for the last 10 years after being inspired by her discovery of the professional community’s lacking knowledge of the condition after she and both of her children were diagnosed with it. “When we were diagnosed and treated, I began to ask more questions of my patients and found that many of them had ADHD as their underlying problem yet had been diagnosed or presented with depression or anxiety along with relationship, marital, and job issues. Since then, I have focused on the understanding and treatment of adult ADHD,” Steeler explains. “ADHD is often a hidden disability in adults,” says Leslie Rouder, LCSW, a therapist with more than 12 years of experience treating adult ADHD and as an ADHD coach. In private practice, Rouder specializes in working with adults with ADHD and also is director of disability services at Barry University in Miami Shores, FL, where she works with many students who have ADHD. She also facilitates ADHD support groups and workshops and is currently the coordinator for the Miami Dade Children and Adults Living with ADD (CHADD) chapter meetings. ADHD is a common neurobiological condition usually diagnosed in childhood. Originally it was thought people would “outgrow” the condition as adults. However, 60% to 90% of adults continue to experience symptoms (Barkley et al; de Graaf et al). In the past, ADHD was not studied as extensively or diagnosed as often as it is now in children, resulting in a high percentage of undiagnosed adults. Symptoms may have been present but were likely dismissed as just bad behavior. An ADHD diagnosis can still be difficult for adults and children since no single medical test exists for reaching that diagnosis. An accurate diagnosis depends on a thorough clinical history and evaluation. In adults especially, an ADHD diagnosis can easily be missed due to comorbid depression, anxiety, substance abuse disorders, and/or other psychiatric conditions. And when an adult exhibits symptoms, ADHD is not usually considered by employers, primary care physicians, and family members. “When I think of the problems associated with adult ADD/ ADHD, I think of that line from a TV advertisement for a credit card—‘It’s everywhere you want to be.’ ADD/ADHD has the potential to interfere with virtually any adult role,” says J. Russell Ramsay, PhD, an assistant professor of psychology and psychiatry at the University of Pennsylvania School of Medicine and clinical psychologist for the Adult ADHD Treatment & Research Program at Penn. Problems associated with the condition most commonly occur in college, work, and relationships, he says. Specifically, ADHD seems to interfere with the individual’s sense of self-control and self-efficacy, thereby affecting his or her ability to establish and follow through on reasonable goals and to manage the various distractions from reaching those goals. “The specific small problems that lead to the larger problems in life domains are procrastination, poor time management, disorganization, distractibility, and poor emotional regulation,” Ramsay notes. At work, symptoms of adult ADHD can translate to a messy work area, trouble starting and finishing projects, chronic lateness, underestimating the time needed to complete tasks, an inability to focus and listen during meetings, and forgetting or missing deadlines. In addition to the common symptoms of distractibility and impulsivity, problems in the area of executive functioning can manifest as an impaired ability to plan and prioritize work duties, says Rouder. Workers with ADHD are rated lower on work performance, are more likely to be disciplined by supervisors, are paid lower salaries, and produce lower quality work (Barkley et al; Ramsay, 2010). Adult ADHD is rarely recognized in the workplace, and those with the condition may be labeled as poor employees or fired, making career advancement or simply maintaining consistent employment difficult. Paradoxically, employees with ADHD may also be viewed as hard workers due to a symptom called hyperfocus, a tendency to become overly absorbed in one task. Actually a coping mechanism for distraction, hyperfocus causes the individual to become oblivious to his or her surroundings to the extent that he or she loses track of time and neglects other duties. Hyperfocus at work may be viewed as productivity but, if left unmanaged, can become problematic if the worker neglects other tasks. ADHD symptoms in adults can also include low self-esteem, memory problems, agitation or a short temper, reckless behavior, risk taking, and a lack of motivation. In addition to workplace problems, these symptoms can lead to financial difficulties, physical and mental health problems, and relationship difficulties. “Adult ADHD can cause problems in all realms and facets of a person’s life. Accurate diagnosis is essential,” Steeler emphasizes. For example, one of Ramsay’s clients, Ralph, had been fired from nine different jobs during the first five years of his marriage and was unemployed for two years before seeking help. He started treatment when his wife threatened to divorce him due to his unemployment, forgetfulness in paying bills, and frequent embarrassing behaviors in social situations. Ralph admitted to experiencing feelings of being a failure, being incompetent, and pessimism about his ability to make changes in his life. Diagnosed with ADHD as a child, Ralph stopped taking medications in college and was ashamed to let employers know about his condition (Rosenfield, Ramsay, & Rostain, 2008). Relationship problems such as the ones Ralph experienced are common for adults with ADHD. For those with undiagnosed ADHD, a pattern of being in bad relationships may develop as a result of underlying self-mistrust, says Steeler. And problems between adults with ADHD and their partners are very common, too. Relationship problems may be magnified when couples seek help from someone who is not well versed in adult ADHD, and more damage to the relationship may occur. When an ADHD diagnosis is made and the symptoms are clearly understood, more effective counseling and therapy can be applied to the individual with ADHD, his or her partner, and the relationship so that healing can occur, Rouder says. For children with ADHD, medications are a primary, and often the only, method of treatment. For adults, medications are often insufficient treatment and if there is symptom relief, it may not translate into work and relationship improvements, says Ramsay. Because ADHD affects each adult differently, what works best for most patients is a treatment combination customized to their individual needs, including education about the condition, medications, psychotherapy, couples therapy, group therapy, vocational counseling, and/or coaching. Cognitive behavioral therapy (CBT) is emerging as an effective treatment for adults with ADHD, and evidence supporting its value is increasing, Ramsay says. CBT can help adults with ADHD identify, for example, self-defeating behaviors and thought processes and assist them in implementing effective coping strategies and behavioral changes (Ramsay). In Ralph’s case, Ramsay and a psychiatrist combined a pharmacotherapy regimen, which helped him focus and complete tasks, with weekly CBT sessions to reach specific behavioral goals. Ralph’s CBT included the use of daily thought records to develop alternatives to pessimistic thoughts and role-playing to improve communication with his wife. Marital counseling with his wife was also eventually added into the treatment plan (Rosenfield et al). Because treatment plans for adults with ADHD are multipronged, social workers can contribute in many ways (see below). But first and foremost, social workers themselves need to become educated about ADHD and ensure their clients have an accurate diagnosis, say Ramsay and Rouder. Rouder recommends the Attention Deficit Disorder Association and CHADD as sources of information on adult ADHD and suggests social workers can both coordinate and deliver therapy. “Social workers can usually refer individuals to psychiatrists and/or medical doctors that can prescribe appropriate medication. And because they are highly trained in the area of CBT as well as group therapy, most social workers can provide excellent therapeutic support. In my experience working with this population, providing adults with ADHD the opportunity to experience the support of other ADHD adults within the group therapy setting is highly effective,” she says. As care coordinators, social workers can interact with psychiatrists and other physicians about medications and comorbid conditions and provide feedback to psychiatrists, other therapists, and coaches, says Steeler. Like Rouder, some social workers in the field of ADHD also function as coaches, helping clients devise practical solutions to everyday problems, such as organizing home and work environments, structuring daily routines, and managing finances. While CBT addresses emotional and behavioral issues, coaching addresses issues that affect daily functioning, such as prioritization, motivation, time management, and procrastination. Social workers are ideally trained to provide both therapy and coaching support to adults with ADHD, Rouder believes. 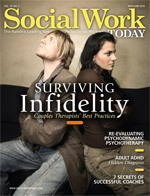 According to Steeler, social workers can also be educators and advocates in the field of adult ADHD. Patients and their families require education on ADHD and how to manage symptoms, and communities and employers can also benefit from education on this topic. As advocates, social workers can assist their clients by interfacing with supervisors and human resources departments about adaptations for the work environment and assist in supporting patient rights in the workplace. All these roles overlap when social workers are fully engaged in the treatment of adults with ADHD because symptoms and behaviors can vary widely depending on the individual. Adult ADHD can manifest outside the typical range of symptoms as addiction or substance abuse, low self-esteem, sleep disorders, and comorbid psychiatric conditions such as depression, anxiety, and bipolar disorder. Social workers can play an important role in helping clients with ADHD sort out behaviors that are linked to symptoms and then guide them to appropriate treatment, Steeler says. For instance, CBT can be applied to address negative thoughts and help patients develop more positive relationships and refocus their goals to be more successful in work and relationships. But CBT is only one tool social workers can apply, says Steeler. Another valuable treatment involves identifying and building on a client’s strengths. “One of the most important treatments is to help the patient identify their passions—and what they are good at—and to focus on developing these passions and strengths,” Steeler says. This technique positively redirects the ADHD symptom of hyperfocus, often enabling an adult with ADHD to be very successful. She cites the examples of Olympic swimmer Michael Phelps, whose hyperfocus helped his swimming career, and Albert Einstein, suspected to have ADHD with a hyperfocus on physics. “When an adult with ADHD is able to identify and focus on their strengths and talents, instead of continuously shoring up their weaknesses, almost anything is possible,” says Rouder. *Note: Previously referred to as attention-deficit disorder (ADD), or ADD/ADHD. With the DSM-IV, the term ADD was eliminated and ADHD is now used with three subtypes: predominantly inattentive (previously ADD), predominantly hyperactive, and combined. However, because many adults do not exhibit hyperactivity, the term ADD continues to be used frequently when referring to adults with the condition. The Adult ADHD Treatment & Research Program at the University of Pennsylvania, a specialty service devoted to evidence-based assessment and treatment of adult ADHD, was formed in 1999 by J. Russell Ramsay, PhD, and psychiatrist Anthony Rostain, MD. Although the program does not currently employ any social workers, it receives diagnostic consultation referrals from MSWs or LCSWs practicing in the Penn academic department or the community to clarify whether their clients have ADHD in order to guide treatment planning. Some patients in the ADHD program may also be working with social workers, and treatment and beneficial social services are then coordinated. • Make sure the diagnosis is accurate. Inattention is probably the most common symptom among several psychiatric diagnoses, and ADHD may not be the cause. Also, adults with ADHD commonly present with coexisting features of anxiety, depression, and/or substance use difficulties. “Getting a competent assessment can be helpful to clarify the overall diagnostic picture,” Ramsay advises. Of the approximately 1,000 patients seen through Penn’s adult ADHD program, Ramsay estimates about one third either did not have ADHD and there was some other explanation for their symptoms or there was some evidence of ADHD but it was secondary or tertiary to another primary condition causing their problems. • Strongly consider a medication consultation. For many individuals with moderate to severe symptoms, medications will form the foundation of treatment. For individuals with mild ADHD, medications may be the only treatment required. • Don’t underestimate the importance of psychosocial treatment. Although medications are the most effective treatment for ADHD symptoms, symptom improvement does not necessarily translate into improvements in daily functioning. Psychosocial treatments, especially cognitive behavioral therapy, have been found to be an essential adjunct for many adults with ADHD and can help them improve their lives. Although ADHD is not the result of negative thinking, adults with ADHD have often developed pessimistic outlooks, at least related to some life roles or tasks, that may interfere with practicing new coping skills. CBT can be helpful in supporting these clients in their efforts to make changes in their lives, says Ramsay. • Start small and find specific goals. When getting down to the work of helping adults with ADHD make changes in their lives, it can sometimes be overwhelming to know where to start. Try to get a larger sense of recurring ADHD-related difficulties, such as procrastination or time management. Then try to find small, specific examples of these difficulties that occur in patients’ lives. For example, asking the question, “What is an example of a situation at work or at home this past week when you noticed procrastination affected your day?” can provide clues to help with intervention, Ramsay says. • Build a supportive alliance. Adults with ADHD often feel misunderstood. Having a strong relationship with a counselor who understands ADHD can help these clients make positive changes. • Denver Treatment Center for Adult ADD: www.roslynsteeler.com. Barkley, R. A., Murphy, K. R., Fischer, M. (2008). ADHD in adults: What the science says. New York: Guilford. Centers for Disease Control and Prevention. (2009, March 13). Attention-Deficit/Hyperactivity Disorder (ADHD). Data & Statistics. Retrieved from: www.cdc.gov/ncbddd/adhd/data.html. de Graaf, R., Kessler, R. C., Fayyad, J., Ten Have, M., Alonso, J., Angermeyer, M., et al. (2008). The prevalence and effects of adult attention-deficit/hyperactivity disorder (ADHD) on the performance of workers: Results from the WHO World Mental Health Survey Initiative. Occupational Environmental Medicine, 65(12), 835-842. Ramsay, J. R. (2010). CBT for adult ADHD: Adaptations and hypothesized mechanisms of change. Journal of Cognitive Psychotherapy: An International Quarterly, 24(1), 37-45. Rosenfield, B. M., Ramsay, J. R., Rostain, A. L. (2008). Extreme makeover. The case of a young adult man with severe ADHD. Clinical Case Studies, 7(6), 471-490.